Experience our coastal getaway on the south coast of France and join us for a weekend of unique bike riding which offers great hills, rugged coast lines and the sandy beaches of the Cote d’Azur. Our base combines the rolling terrain of the Massif des Maures with coastal scenery for a spectacular cycling weekend holiday in the South of France. 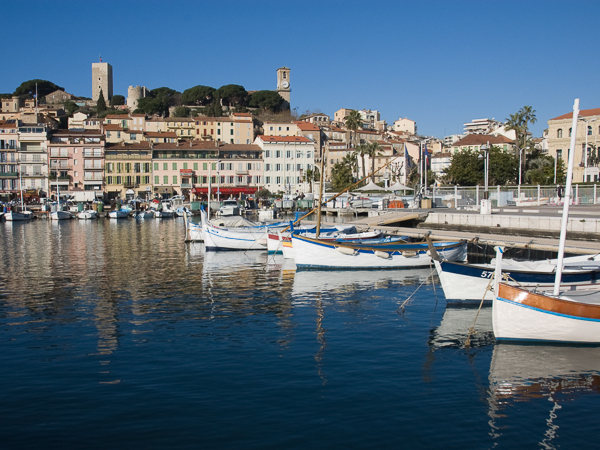 With the world-famous, glamorous village of St Tropez nearby and a choice of beautiful sandy beaches there is plenty to do and see when you’re not in the saddle, making this an ideal short break destination for combining cycling with early and late summer season sunshine. The hills of the Massif des Maures present varied and exhilarating road biking routes, along quiet roads flanked by cork oaks. Although gentler than the Alps there are still a number of cols to conquer and circular routes to provide a good workout whilst taking in beautiful sea views. After a long morning on the road, cool down with a dip in the deep blue waters of the Mediterranean Sea. This is not your average beach break! 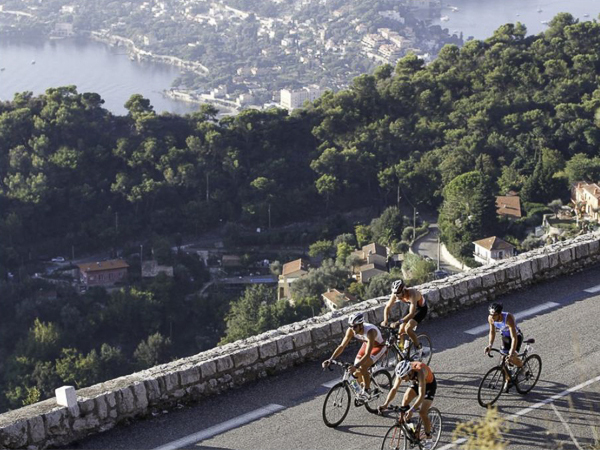 Bike Weekender cycling breaks on the Côte d’Azur are based in the charming seaside town of Le Lavandou. The town boasts 12 sandy beaches – from hidden coves to wide open bays with fine sand and calm blue waters. Le Lavandou is a friendly and lively beach resort which is well placed as a cycling destination, allowing us to mix coastal and hill routes throughout the long weekend. We access the Massif des Maures via the hilltop village of Bormes les Mimosas, and our cycle routes inland take us up and over forested cols before we drop down once again to the coast at St. Tropez and Grimaud. Imagine a morning riding in the hills followed by a leisurely cafe lunch, before cycling back along the coast passing sandy beaches and craggy headlands, through pretty little fishing villages, to finally arrive back at your base in Le Lavandou to relax and have fun on the beach in the warmth of the South of France. The Côte d’Azur benefits from over 200 days of sunshine every year, and temperatures can rise well above 30˚C in mid-summer. As such, we offer our cycling breaks on the Côte d’Azur towards the beginning or end of summer, starting in May, finishing in October, to avoid the hottest part of the year. It’s no surprise that many top professional cyclists and coaches train and are based in the south of France to take advantage of the year-round pleasant climate and superb riding conditions. 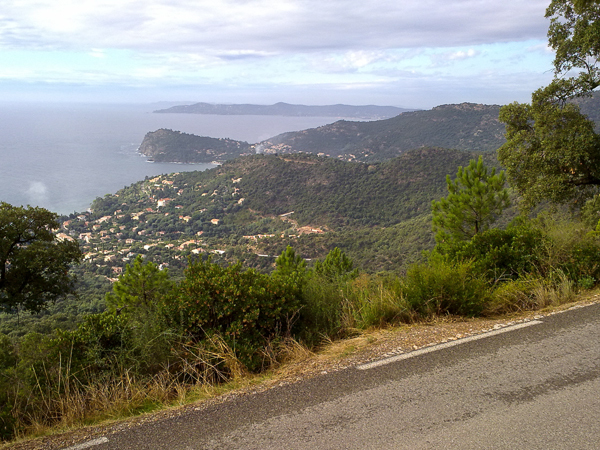 Whilst many of the cycle routes along the Côte d’Azur gently roll around the coastal contours, the Massif des Maures hills, set back from the sea, offer numerous climbs and adrenalin-inducing descents. Inland from the coast, traffic free, well maintained roads are another draw for cyclists to this area. There are plenty of exhilarating and challenging cols including Col de Babou and Col de Canadel, plus Notre Dame des Anges which is a 13km climb from Collobrieres up to 780m – touching 11% in places. The deep blue Mediterranean Sea provides a stunning backdrop to many of the rides; this location is an ideal place to mix cycling and unwinding, with our weekend formula giving you 4 days of active relaxation in a wonderful sunny setting. 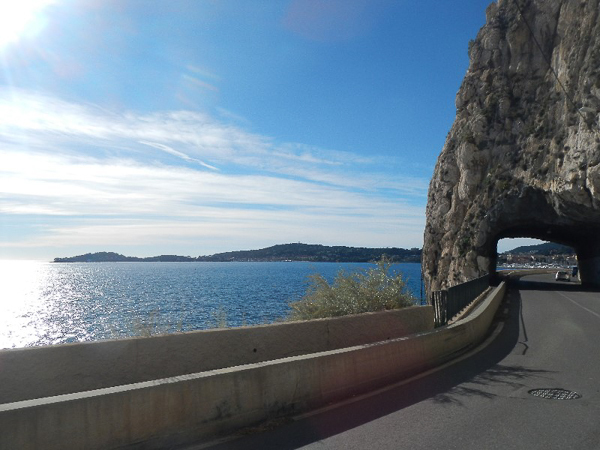 We can help to plan exciting cyling routes on the Côte d’Azur whatever your fitness level and cycling experience – this location lends itself very well to mixed ability groups, beginners and people starting out on a road bike. Enjoy a long weekend of cycling in the sunny South of France – rolling hills and rugged coastline with sandy beaches framing the azure blue of the sea. The rides are not just about cols and climbing (although we will be still ticking a few off during the weekend); we’ll explore the region and take time to end our rides at places such as St Tropez. With our full vehicle support, you can change out of your lycra and join the celebs in town, or just let us take you to the best beach for an refreshing swim before heading back to our base. Groups of 6 or more people can take advantage of our customised solutions; we’ll tailor make a weekend or holiday for you and your friends in the South of France. Trip durations and locations can all be varied to best meet your needs. Like the Idea of Cycling in the Sun by the Seaside?